Empty boxes are a huge source of amusement for small children and our pets, but for the rest of us, they mean nothing most of the time. However, the one exception to this is when we are preparing to move. At that time, many of us desperately start out on a hunt to find boxes of all sizes and types. Some people opt to pay for boxes but with a little initiative, you can find free boxes for your move in a number of places. 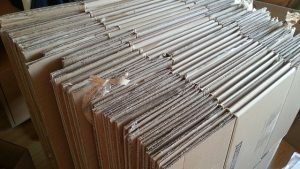 Here are just a few places you can find boxes for free thus eliminating one more moving-related headache. Bookstores: Most bookstores such as Barnes & Noble, Borders, Books-A-Million, etc. receive shipments of books regularly throughout the day. Moreover, since books are heavy, boxes of all sizes are required for these shipments. Politely ask your local bookstore manager if you can relieve him/her of his/her empty boxes. Russell’s! : Russell’s offers half off of gently used moving boxes! We make sure that they are still intact enough to handle the capacity of any move securely. This is by far the best bang for your buck! Craigslist: Many people do not know this but Craigslist is a huge source for free items. Members of this eBay competitor regularly list items they wish to give away via the site’s “Free” section including everything from pianos to sofas to, of course, boxes. People who have just moved: Fortunately for our Beverly Hills moving and Storage Company, people are moving all the time. This fact can also be a boon for you since people who have recently moved often have plenty of extra boxes around they are trying to get rid of. Ask around your neighborhood to see who may have a garage full of moving boxes. Liquor Stores: Large liquor stores receive shipments regularly and the boxes used to hold their products are usually sturdy. Ask your local liquor storeowner if you can take these empty boxes off his/her hands. Home Improvement Stores: Stores like Lowe’s, Home Depot and True Value are excellent places to get large boxes such as the kinds that hold large appliances. Ask the manager for spare boxes that would otherwise have to be broken down at the cost of needed manpower. Finally, our relocation company in Los Angeles works to make that cross country, or cross-town, move that much easier for you. That’s why we work carefully with our customers to plan every aspect of their move.